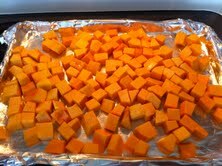 Over the years, I’ve developed a fondness for butternut squash and like to try it in different ways. 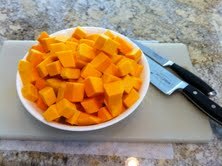 I decided to prepare a ragout combining butternut squash with lentils for a hearty, meatless meal. A ragout (pronounced – ra-goo) is a simple method of preparation which involves slow cooking. Ragouts can be prepared with or without meat. A variety of vegetables may be added, and the dish can be lightly or heavily seasoned. It’s all according to your taste preferences. 2. While the vegetables are roasting, place the lentils in a 6-quart pot covering them with cold water; bring to a boil. Partially cover the pot; reduce heat to simmer and cook until lentils are tender but not mushy, about 30 minutes. If the water evaporates, add a little more. 3. Add 1 cup of vegetable stock (or water) to the pot with the lentils; bring to a boil. Reduce heat. Add the cumin, cinnamon (or allspice), lemon juice, and roasted vegetables; simmer for about 15 minutes to combine flavors. If the ragout appears to be too dry, add a little more vegetable stock or water. 4. Just before serving, season with salt and pepper, and adjust other seasonings, if necessary. Garnish with chopped parsley. Serve with rice or couscous, if desired. NOTE: If you’d like to make this dish a bit more elegant, you can add 1/4 cup of coarsely chopped, dried apricots, softened in a little hot water, to step #3. Robyn's Suggestion: If you have any leftover ragout, give it a whirl in the food processor. Add a bit of liquid (water or broth) to thin it out, heat it through, and serve it as soup!